More than 80 people were killed as Bangladesh building housing garment factories collapsed Wednesday morning. Concerns over safety conditions in garment factories sourced by U.S. retailers were revived Wednesday when a factory collapsed in Bangladesh, killing at least 199 people and injuring hundreds. The building housed several garment makers -- including New Wave Style, Ether Tex, Canton Tech Apparel and New Wave Bottoms. The contractors appeal to cost-conscious merchants because of the low wages they can pay Bangladeshi workers. According to Charles Kernaghan, director of the Institute for Global Labour and Human Rights, which has two officers on the ground, the popular kids chain The Children's Place (PLCE) sources from a factory located in the building. And the website for Ether Tex listed Wal-Mart (WMT)as one of its buyers, though it is not clear if the retailer was currently sourcing from the factory. In addition, the Workers' Rights Consortium, an organization that monitors labor, said that factories in the building also made clothes for Dress Barn (DBRN) and Joe Fresh. Wal-Mart said in a statement that it is investigating whether the factory was currently producing items for the company. A spokesman for The Dress Barn said the company hasn't purchased anything from these factories since 2010. A Children's Place spokeswoman said one of the factories in the building had produced apparel for the retailer, but it wasn't producing products for it at the time of the collapse. A Joe Fresh spokeswoman said that one of the factories was producing a "small number" of apparel items for the brand. British retailer Primark confirmed in a statement Thursday that one of its suppliers occupied the building. It said its "ethical trade team" is collecting information about the workers and will provide support where possible. Kernaghan said that workers left the building after seeing a large crack on Tuesday. He said a government official inspected the building and advised workers not to go in. However, when the workers returned Wednesday morning, the building owner said it was safe and that if workers didn't return to work, they wouldn't be paid. Workers entered at 8 a.m. and the building collapsed around 9 a.m., Kernaghan said. Officials say that hundreds of people remained trapped in the wreckage. 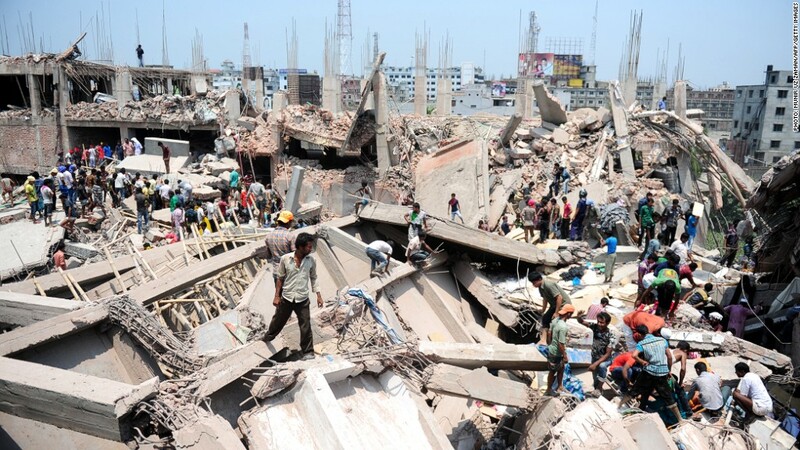 The eight-story building was located in Rana Plaza, a busy section where many of the country's garment factories are found. Wednesday's collapse comes on the heels of two deadly garment factory fires near Dhaka last November. At the Tazreen Fashions Factory, 112 people were killed and at least 200 more were injured. Two days later, a fire broke out at another factory nearby. Eyewitnesses said that managers had locked the windows and gates to the buildings, which had no fire escapes, effectively trapping the workers, many of whom jumped out of windows leading to injuries. Tazreen had made goods for Wal-Mart and Sears (SHLD), though both companies said they weren't aware that the factory had made goods for them. The Workers' Rights Consortium's executive director, Scott Nova, said the disasters keep happening because companies put pressure on factories to lower prices, which results in substandard safety conditions. 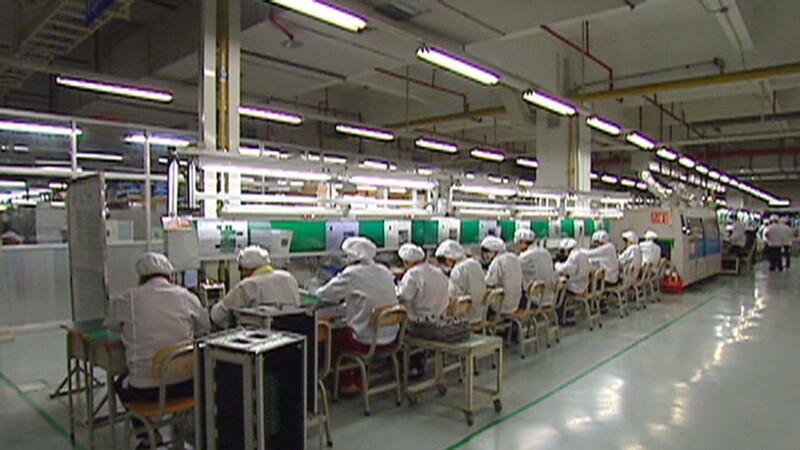 The average minimum wage is 14 cents an hour, and senior sewing operators make about 24 cents, according to Kernaghan. "These are the lowest wages in the world, and the factories with the worst health and safety conditions," he said. "Yet the big companies love the cheap wages, the long hours, because they are all about the costs." These low costs have propelled Bangladesh's garment industry into one of the biggest in the world. The country has about 4,500 garment factories that make clothes for many global stores, including Gap (GPS), H&M, Wal-Mart, J.C. Penney (JCP) and Sears (SHLD). It's on track to surpass China within the next seven years as the largest apparel manufacturer in the world. Already, Bangladesh's ready-made garments make up 80% of the country's $24 billion in annual exports. Both Nova and Kernaghan agree that the industry's influence over the economy plays a role in why the government isn't doing more to improve conditions. "The worse the dangers get, the more business comes in, so the government has no incentive to fix anything," Nova said. "We ask ourselves every day what it's going to take to fix this."